The number 108 is considered sacred, and continues to pop up in yoga, nature, and astrology. What’s the big deal? The namesake of our signature one-day event, explained here. Our 2019 event calendar is live! We’ll be teasing out our teacher and speaker lineup over the next couple of weeks, and announce music headliners in early February. Tickets go on-sale January 22. Mark your calendars. It was astronomer, mathematician, and physicist Galileo Galilei who said the universe is written “in mathematical language”—that the mysteries of creation itself could be unraveled through numbers and equations. For the mystics, such numbers offered more than a scientific explanation—they offered a code for awakening, a code to our own nature. And for the yogis, that code is 108. In yoga, the number 108 refers to spiritual completion. It is why japa malas are composed of 108 beads, why pranayama is often completed in cycles of 108, and why sun salutations are often performed in nine rounds of the 12 postures (totaling 108). By practicing chanting, breath work, or asana in rounds of this sacred number, the ancient yogis believed we could align ourselves with the rhythm of the creation, and ultimately bring an end to our cycle of reincarnation. When we start to drill down into our human form we continue to find the number 108 over and over again. Exactly how the yogis arrived at 108 we don’t quite know, but it seems to be a number that connects us to our place in the cosmic order. The distance between the Earth and sun is 108 times the diameter of the sun. Is it possible that our ancient ancestors knew this? Around the time the ancient Vedic texts were being collected, far away Stonehenge was built—the Sarsen Circle is 108 feet in diameter. In Belize, during the era of the Mayans, the High Temple of Lamanai was erected at 108 feet tall—the same height as the funerary Tikal temple in Guatemala. And within the temple of Kukulkan at Chichen Itza in Mexico archeologists believe there to be a second pyramid inside measuring 108 feet wide. These temples, built to worship and to house the souls of great leaders upon their death, perhaps used this number to connect humans not just to our sun as a giver of life, but to the Creator. In yoga we are often reminded that “as above, so below,” and when we start to drill down into our human form we continue to find the number 108 over and over again. Were we to draw a five-pointed star (representing a human being) inside a circle (a planet) and we would find 108 degrees staring back at us from every angle. Deeper into the microcosm of the human being, it is said there are 108 energy lines, or nadis, converging to form the heart chakra, and 108 marmas (pressure points) or sacred parts of the body. And 108 degrees Fahrenheit is the internal temperature at which the human body’s vital organs begin to fail from overheating. Like the mantra Aum, 108 seems to have an essence that connects us to the whole. In astrology—our connection with destiny—108 also appears frequently. The Earth, for example, is said to have an astrological cycle of 2160 years (20 x 108). While there are also 27 lunar mansions in Vedic astrology spread over the four elements, or the four directions (27 x 4 = 108). Throughout spiritual teachings beyond the traditional yogic texts, we are reminded of this number in our search for liberation. Hindu deities have 108 names, and India is said to have 108 sacred sites. In Jainism there are believed to be 108 virtues. In China, some forms of Tai Chi have 108 moves. While in Tibetan Buddhism there are 108 delusions. Many Buddhist temples have 108 steps representing the 108 steps to enlightenment, and in Japan, at Zen Buddhist temples, a bell is chimed 108 times at the end of the year closing a cycle to serve as a reminder of the 108 earthly temptations a person must overcome to achieve nirvana. Like the mantra Aum, 108 seems to have an essence that connects us to the whole. Be it used to guide sun salutations, to tally up the number of chants to the Divine, to count the steps leading up to a temple, or to measure the structures built for the heavens, it serves as a reminder of the wonder and interconnectedness of the universe. 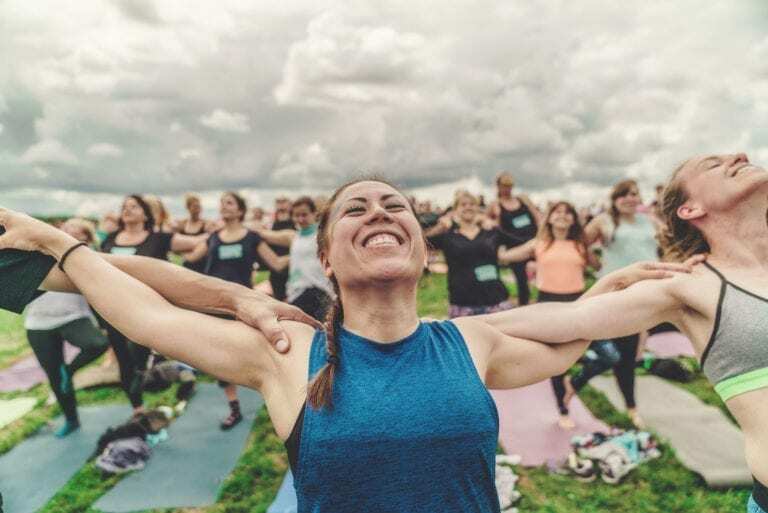 Experience a plethora of mindful activities this fall at the Wanderlust 108. For more information, click here.